Last Monday, March 14, Tom Waits was inducted into the Rock and Roll Hall of Fame by Neil Young at New York City’s Waldorf-Astoria Hotel. The ceremony will be broadcast tonight on the Fuse Network. He also recalled how, at age 15, he had snuck in to see a Lightnin' Hopkins show by putting 'Wite-Out in my hair and drawing on a moustache'. 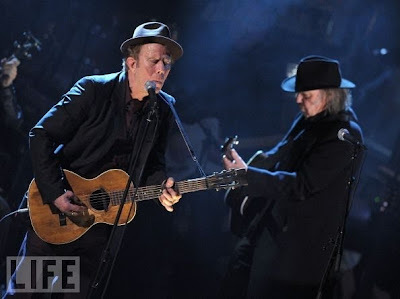 Waits compared his induction to receiving the key to the city of El Paso: 'They told me there was only one but I found out there were a whole bunch of them, and they didn't open anything. 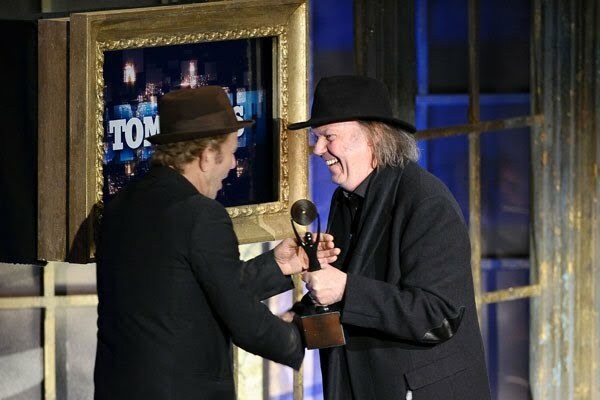 Neil Young: "I didn't bring my teleprompter or my notes and I don't have any real thoughts. I will say that this next man is indescribable and I'm here to describe him. In the scope of things this man is a great singer, actor, magician, spirit guide, changeling and performer for you." More on ceremony broadcast tonight on the Fuse Network. Also, see The Rock and Roll History of Two Time Rock and Roll Hall of Famer Neil Young. Darlene Love is the voice of Rock and Roll no doubt. Alice Cooper, the villian of villians. Good to see that band together rocking again. Still sound great. Get behind the mule must have been the 100 year precurser to Get behind the Wheel....they sound alot alike to me.